Merry Christmas Everyone!! I hope you are all enjoying the holiday season. It has been a quiet Christmas in the Stedman house this year. Most of our extended family was away this year and normally we would have heaed to Perth to be with my sisiters, but with the extended retail hours we were unable to go to Perth. My own thought is that the shops should not be open Boxing Day, but judging by the crowds that go each year I guess I am in the minority. So if you are shopping on the holiday days, spare a thought for the workers who are not able to be with their family. And that's my whinge for the day!! Now to the more important things. As I said it was a quiet day for us, a trip to church in the morning and an afternoon visit to Matt's Aunt and Nana and all meals at home with just us. The kids were very excited with their Nintendo DS, one each. Matt got one too so the four of them were happy playing games together!! And what did I get? An Ipod and earrings. Thank you to my my hubby and kids. I also got a special gift from my Secret Santa from the ESAD group. I think my Santa is Kim Conway, a talented crafter and very generous gifter! There was notebook decorated with kaleidoscope DSP from the Summer mini and my name in chipboard and glitter (Isobel wont be stealing this one! ), a cutter kit, heat & stick powder, dazzling diamonds and a gift box made from the I Wish simply scrappin' kit. Below is a photo of all the goodies inside. Stampin' Up! are having a sale!! YAY!! This doesnt happen very often so it's a really big deal. With 23 different stamp sets from 25 - 50% off this is a sale not to be missed!! There are also ribbons, dsp, hodge podge and other accessories all going cheap. All items are from the current Idea Book and Catalogue. This sale finishes on the 24th January or until stocks last, so make sure you get in early to secure your goodies. Check out the Stampin' Up! customer homepage (link in the right hand column) for all the details and then give me a call. Gift cards are a great idea for those hard to buy for people, the only drawback is the boring old envelope its normally delivered in. So this gift card holder is perfect for brightening the card and celebrate Christmas. I found the template on Splitcoast amongst the new technique challenges. It is just a simple stocking shape on two pieces of cardstock, taped together and a flap from the back piece to hide the card. I have used last year's incolour and designer paper as I had heaps of the Christmas paper left over so didnt buy any this year. Summer Mini Catalogue Blog Hop!! The Summer Mini Catalogue is here!! 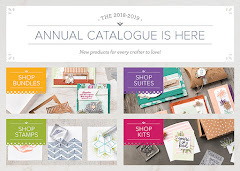 This blog hop is designed to give you a chance to see the great products in the new catalogue and ideas on how to use them. Not only do you get to see most of the new catalogue in action, but you could also win a great prize! The event has been organised by Leonie Schroeder, leading lady at ESAD-AU. ESAD stands for Extra Special Aussie Demonstrators and is a yahoo group for Stampin' Up! demonstrators in Australia and New Zealand. With hundreds of members throughout the region it is an invaluable resource for ideas and inspiration. 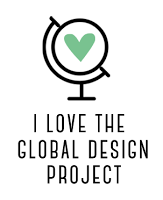 If you as a crafter have a question about products or projects and I dont know the answer ESAD is the place I go to. I ask your question and I guarantee by the end of the day I will have half a dozen responses from other demonstrators. There also craft challenges, business tips and photo albums full of beautiful items these talented ladies have created. So if you are a SU! demonstrator and not a member, just click the button for an invite. And this is my project for the Blog Hop!! This Valentines card was made using a new stamp set called I (heart) hearts. It is a set of 8 stamps and I love it! It is made up of hearts in different sizes and patterns. but best of all it co-ordinates with both of the heart punches available in the 2009-10 Idea book and catalogue. I also used 3/4" polka dot ribbon, new in the mini. So where are the polka dots? On the reverse side! Yep, the ribbon which is a gorgeous real red colour can be used two ways making it even better value! Accesorries: 3/4" polka dot real red grosgrain ribbon and scallop square punch. This blog hop has 30 people involved, so make sure you have time to check them all out. If you do and leave a comment on every post you will go into the running to win some great Stampin' Up! prizes. Once you have been to all the blogs and left a comment you need to send an email to Leonie at leonie@stamp-a-latte.com to let her know. It doesnt matter where you start in the hop, it works as a circle just keep following the links at the end of each post. Next you will go to see Chantell Randalls's blog.